Convert a new or used pallet 1000X1200 mm, into a pallet box for the storage of your heavy, bulk and/or high value products. You obtain a volume of 0.25m3 or 250 liters of capacity. You can accumulate several of them and increase the capacity of the useful volume of your crate. However, we prefer not to exceed 5 extensions and already allow a filling height of one meter and an interior volume of 1.25m3. The support pallet must be adapted to the maximum load of your articles. The 100X120 Europe pallet three or five soles can support up to 1.2 tons, the half heavy 750kg and the lightweight +/- 300kg. 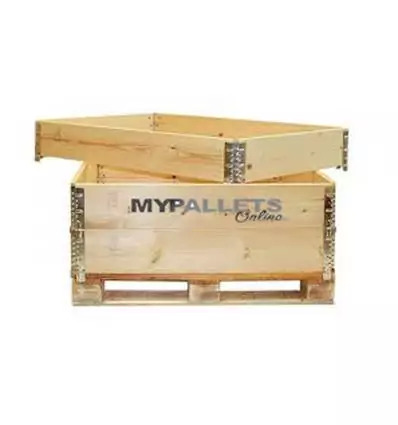 After use, your pallet collar folds up for storage and takes up little space horizontally or vertically. For the shipment of high value products, collect your extensions while saving in transportation by folding it. Wooden extensions are multi-purpose and reusable storage products for your internal and external logistics circuits. Depending on the conditions, you and your clients can organise a guarantee system to preserve and protect your assets. You wish to identify your rehausses? we mark them "with fire" with your Logo or your mark on 1, 2 or 4 faces. We can also mark your extensions with a unique or chronological number according to the property identification you wish to manage your fixed assets. New foldable collar are manufactured in 200 mm high boards in resinous tree species (pine or fir) with 4 planed and surfaced faces. The model presented is assembled with first choice boards. 1st choice notifies the almost absence of apparent knots. The visible knots do not present any risk to the characteristics of the extensions as long as they remain attached to the wooden board. 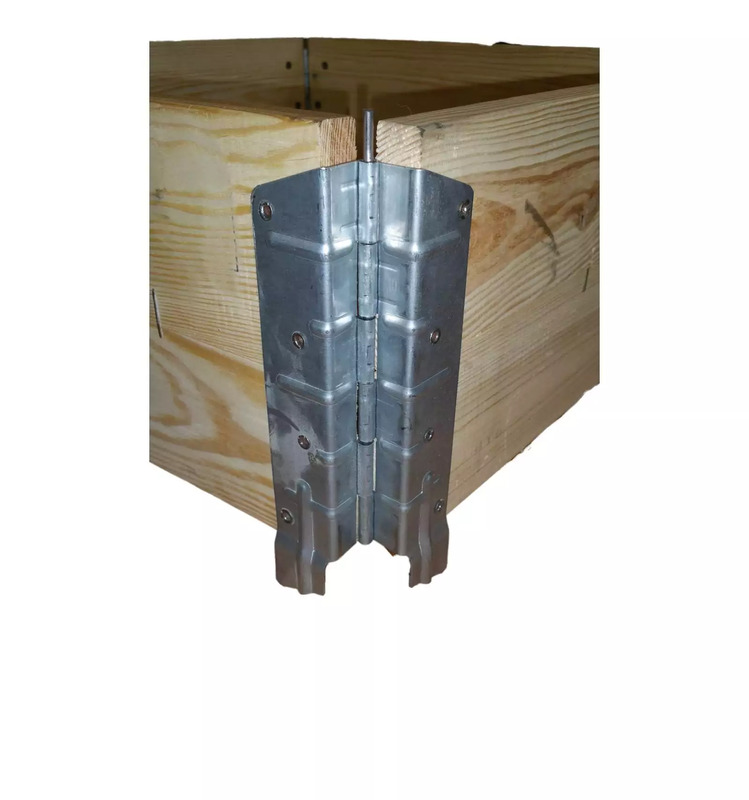 4 galvanized steel hinges make up the assembly and are riveted at the corners with 8 rivets. The attachment points measure 30 mm and are designed to fit perfectly into the corners of the pallet. Once installed, the extension does not become detached from the pallet during handling either with a forklift truck or with manual or electric pallet trucks. All our folding extensions are heat treated (heat treatment) and are approved to the ISPM15 standard (see our article on the standard). With our certificate, you export your products without risk during customs clearance. We also offer you to dry your extensions in an oven specially adapted to wood. We will send you the drying certificate and the average dryness values. We prepare your parcel on a wooden pallet containing 120 folded extensions. On request, we can reduce the quantity to a minimum of 100 pieces. Your order is carefully prepared and packed to avoid damage during transport until it reaches your home. The total length, once folded, is 1 times the length + 1 times the width for the extension 100X120, 2.2 meters length. As from the validation of your order, we deliver you under 10 days maximum directly from our manufacturing plant. We deliver everywhere in metropolitan France and also everywhere in the world on simple request. We advise you to store your extensions inside when they are not in use in order to prolong their lifespan. This being said, you can also load or empty for space reasons favour outdoor storage. We have a wide range of foldable collar to match your needs in size and at the best prices. In the same dimension 100X120, we can offer you new, less expensive extensions in two 100mm boards or in standard choice wood (with visible knots). Your use is punctual and you do not need a new product, we also present you a wide range of possibilities in second-hand extension, see. On simple request, we study for you the best solution and deliver you within 5 days maximum. Aucun problème, conforme à nos attentes. Je ne donne jamais 5 !